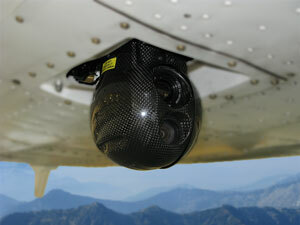 One of the most unique and powerful features of this firefighting aircraft, and one which separates this aircraft from most all others, is the live video feed capability. In cooperation with the Fire and Technology Development Center in Missoula, MT we can send live streaming video from any of the cameras onboard to receivers on the ground that then relay the signal to a web-based server. Anyone with internet access and the proper authorization can view the video live. This air attack platform will far exceed your expectations with its ability to extend customary air attack shift lengths. With the addition of a second pilot, we are able to fly early morning fire status and mapping missions, while giving updates prior to deployment of resources and to validate the tactical plans for the operational shift, then fly into the night time hours during critical burn-out operations. The Cloud Cap Technology Retractable Tase Duo Camera Gimbal provides a full featured gimbal control with a moving map interface. Other features include object tracking, scene tracking, steering and geo pointing. You can point it at a specific location and it can tell you the latitude & longitude of the location that you are looking at. It is controlled either by the computer or a game boy joy stick. A Falcon high performance laptop computer is employed to control the gimbal and run moving maps. 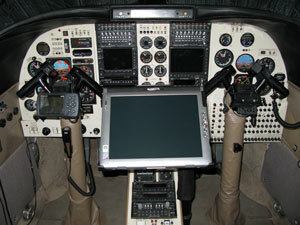 Also, attached are two HP touch screen monitors, one at the air attack position and one near the rear pedestal. Live video enabled the Incident Command Post, the Forest Supervisors Office, Dispatch, and other interested Fire Management Personnel instant access to live video of the fire. This allows Fire Managers to monitor the intensity and progress of the fire during the day, as well as the success of several night time burning operations. The added capapbilities of IR camera and the ability to fly at night and see through inversions layers is essential in pinpointing accurate areas to safely deploy resources on spot fires. There are six recorders; four record cameras individually and continuously, two more record simultaneously the video input that is selected from any of the cameras. The date, time and aircraft position are embedded in the video. Audio from incoming and outgoing radio traffic along with intercom traffic are also recorded on each disc. These discs can be used to see, monitor and document actual fire behavior and growth. They are available immediately after each flight and can be sent to fire managers and given directly to trainees for review with the trainer or for self evaluation. You can capture still images from any camera and send that image almost instantly to ground firefighters or fire management. Positioned in the rear is a pedestal-mounted console that includes an audio panel, busy lights, a VHF-AM Victor radio, an FM radio and a Sat Phone Controller. This equipment is identical to the front and allows the independent control of all communication equipment by a third crew member. Trainees get immediate exposure to the operation of the radio equipment even while they are in the back. The trainee can transition to the front sooner because of this exposure and because the ATGS has complete access and control of all radios from the rear. You can utilize two ATGS to split the load, or a technician if the mission requires it. The pedestal is situated in front of the rear seat. Most of the communication equipment is mounted in the front panel. This allows for the most natural position for viewing. There is very little need to be looking down to the front lower console. Push to Talk can be accomplished in three ways: a button on the control yoke, by using a foot switch or by a transmit button on a hand-held joy stick that also allows you to scroll through FM radio channels. We flew some of the first scheduled air tactical missions conducted at night. We were able to monitor several night time burning operations, locate spot fires outside control lines and assist in mapping fire perimeter changes for updating maps. The inclusion of an additional pilot in 2010 allowed us to make the aircraft available for early morning and late night flights. 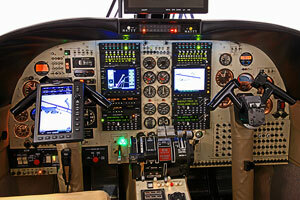 We were able to manage pilot duty time requirements to allow daily availability of the aircraft. 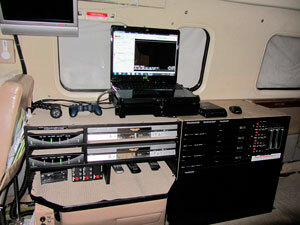 Four NAT NPX 136D Digital FM Radios: We are able to clone frequencies to all four radios from a Laptop in flight. Three Technisonic A711 Audio Panels: These allow each operator individual volume control for each radio. Three busy light indicator bars: These allow each operator to see which radio is calling and if any are transmitting. The Garmin 696 Portable GPS. Satellite XM Weather: Includes weather and displays TFRs directly onto the moving map while in flight. 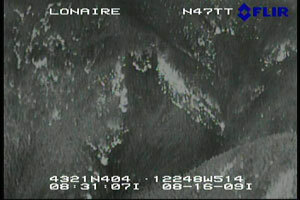 Four fixed cameras: two color and two infrared: One of each camera looking forward and one of each looking to the right at the fire. Individual cameras can be independently selected for viewing on multiple screens. 24 Volt DC, 12 Volt DC and 110 Volt AC power is available: You can power almost anything; computers, printers, cameras, etc. The Garmin GNS 530 GPS Moving Map, with a traffic display. 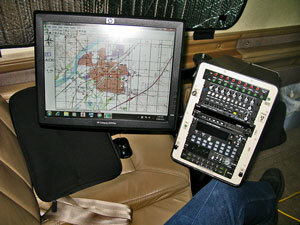 The Apollo MX 20 MFD Moving Map: This displays traffic, Jeppesen approaches, terrain and airspace boundaries. The Bendix/King Color Digital Profiling Weather Radar. Satellite Phone System: Phone includes voice, data and Automatic Flight Following. Anyone can pick up a phone and call us direct in the air.